From time to time I receive notices about the activities various organizations have undertaken, sometimes from New York History itself. Some of these activities stand out as going beyond the routine. The good thing is they can be replicated. This notice is from a municipality which had a big anniversary celebration last year and which has continued to offer programs on its history. This history program should be offered in every county. &#8220Discover Staten Island’s fascinating past during an eight week series for the general public at Wagner College this spring! Permanent settlement in 1661- Slavery- the Revolutionary War- Houses of Worship- Farm Colony, Quarantine Station, Sailors? Snug Harbor, Sea View Hospital- Fort Wadsworth, the Conference House, Alice Austen House, Staten Island Zoo, Fort Wadsworth- the Civil War- South and Midland Beaches- archeological digs- movie houses- movies made on Staten Island including Splendor in the Grass and The Godfather- Cornelius Vanderbilt, Frederick Law Olmsted, Alice Austen, George William Curtis- the Kreischer Brickworks, Rubsam &amp- Horrmann Brewery, S.S. White, the fireworks factories, Proctor &amp- Gamble and much more! As regular readers of my posts surely know, community heritage day is a program near and dear to my heart. This program incorporates many of the elements I have specifically identified for such a program including participation by the town supervisor and municipal historians. Notice the multiple time periods covered including the connections to the current Bicentennial and Sesquicentennial. Notice also the discussion about the challenges facing the town. All the historic sites of the community were connected to this ceremony. This was a real community event. 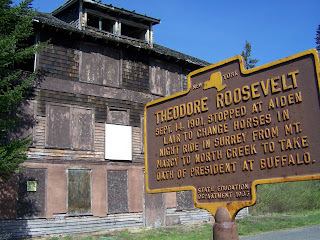 The image accompanying this post shows the infamous NYS historic signs so beloved by so many and the source of so many traffic accidents as drivers make immediate stops to get out of the car, read the sign, and take a picture while the rest of the family rolls its eyes and tries to hide any future signs. Imagine collecting spotting them the bird-watchers do! The Town of Plattsburgh invites the public to its Heritage Day on May 19 at the Town Hall celebrating 227 years of the unique events and personalities that have changed the Town. Outstanding local historians will provide displays and a fascinating take on events, people and places in our town. Participants are invited to bring ancestor stories, old photos and relics to share. Food and drinks will be available. 11:30 Arthur L. LeFevre – former Town Supervisor. 1968-1995 and Bernie Bassett – Town Supervisor, discuss recent events and issues facing our town today. This county, which I think is planning a county history conference in 2013, issued county history passports as part of the celebration. One should not underestimate the importance of something tangible in creating a lasting memory. I have a dream that one day people will collect history passports at the town, county, and state level. Indeed, students should be given such passports! The public was introduced Saturday evening May 19th to Madison County’s cultural and heritage sites, and to the observance of the Sesquicentennial of the Civil War with a series of concerts leading up to the 20th Annual Peterboro Civil War Weekend on June 9 and 10. The audience entered into 19th Century America through the doors of beautifully renovated Madison Hall in Morrisville. Delicious refreshments were available at the beginning, and throughout, the evening. Women in mid-1800s costumes distributed Madison County Cultural and Historic Passports. President Lincoln, Gerrit Smith, Elizabeth Smith Miller, and Anne Fitzhugh Miller were on hand to autograph passports upon request. Hugh Humphreys opened the program reminding the audience of the important role that Madison County played in the Civil War. The connection of John Brown to Madison County and the raid at Harpers Ferry was recognized. Magpie, a musical duo that studies the antecedents of the war, with particular attention to John Brown, presented musical compositions on people who strived for the abolition of slavery. Magpie will return with seven other musicians to the Earlville Opera House on Friday, June 8 at 7:30 pm to present Four Seasons, Four Years ~ The Civil War: A Musical Journey. This ensemble will perform only for the Sesquicentennial years. Despite all the talk about social media, radio and cable TV with municipal stations that are eager for contributions, provide another way of reaching out to the public. Broadcasts can be taped and be available on DVDs for schools. Crossroads of Rockland History&#8221 airs on the third Monday of each month at 10:10 am on WRCR radio 1300AM. Join us as we explore, celebrate and learn about our local history with different topics and guest speakers every month. 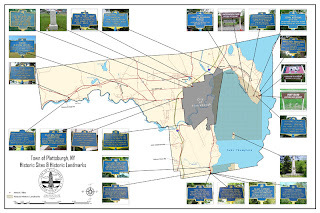 Tune in to Crossroads of Rockland History on Monday, February 20th right after the Steve and Charlie Morning show when the topic will be Orangetown and it’s history. gues at the Orangtown Historical Museum and Archives. We’ll learn more about this new publication, released on January 16th, and we talk more about all things historic in Orangtown! Notice the mission and objectives to be achieved through through this effort. As with passports, the tactile, the physical, is an important part of community building. No one bequeaths an URL to posterity. We may no raise barns together but there are other ways to bring people together through a shared physical experience that produces something physical. The History Center in Tompkins County and Village at Ithaca will be proud to present Village of Quilts throughout the month of June. Village of Quilts will be an exhibition specially designed to engage and actively involve community members in raising resources to support and sustain the important work of the Village at Ithaca. At the heart of the Village of Quilts will be an auction of donated, home-made quilts that will be displayed at The History Center and auctioned off to benefit the programs at the Village at Ithaca. This effort will be a powerful combination of awareness building, friendship making and fundraising. Village of Quilts will support the mission of the Village at Ithaca, which is to bring community members together around a commitment to excellence in education for all children- give community members ownership in the mission/work of the Village- use quilt display to inspire and touch the hearts of community members with a visual representation of community togetherness. Anyone wishing to donate a quilt of any size can find information online at the Village at Ithaca website www.villageatithaca.org. For more information on Village of Quilts, please contact The History Center at 607.273.8284. All these actions, some one-time, some ongoing, represent some of what people are doing to preserve local history. These are the ideas which should be shared, and in some cases have been, at state conferences. We should be learning from each other what works and what doesn’t work and using our state conferences and workshops to help our 62 counties, 1600 plus towns, villages, and cities, and regions to continue to tell the story of who we are for the next generation.